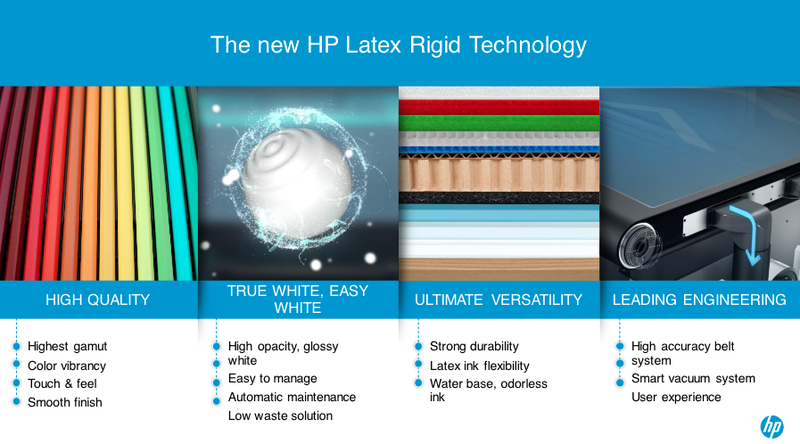 HP Inc. released its first latex ink that is capable of being printed on flexible and rigid materials today, with HP Latex Ink. The HP Latex R Series is the first example of HP using its flexible printing capabilities onto rigid materials that include foamboards, foam PVC, cardboard, fluted polypropylene, solid plastics, aluminum, and of course, wood. In short, this is durable ink that is used in commercially packaged goods and for promotional signage. HP Latex R Series will be available in the third quarter of 2018. Falling under HP’s Signage & Decoration category of its print business, HP presents it as an alternative to UV technology, the standard for most rigid printing today. What’s wrong with UV ink? According to HP, it smells, has an issue with low gamut and dull colours, and the ink tends to peel off and chip away. Latex is sold as providing vibrant colours while preserving the material feel. Plus, it doesn’t small and it’s water-based ink. Its applications could range from retail and outdoor signage, to decorations and car wraps. The HP Latex R Series has a six-colour ink set and can also print white latex ink. The printer solves a problem that prevented the use of white latex ink previously by recirculating it to avoid settling. No pricing has been disclosed.